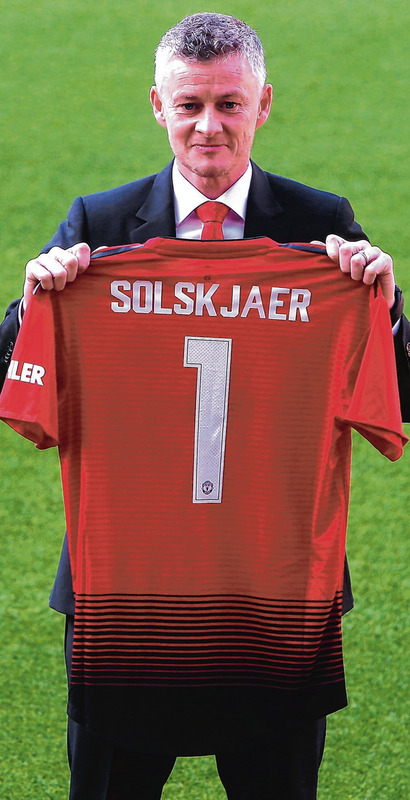 Solskjaer’s impressive caretaker spell at Old Trafford came to an end yesterday upon confirmation of him signing a three-year contract worth approximately £7million-a-year. The former United striker succeeds Jose Mourinho on a full-time basis, 99 days after leaving Molde in his native Norway in order to take temporary charge at Old Trafford. Solskjaer has transformed his old club’s fortunes since arriving in December, taking United from 11 points behind the top four to within two of qualifying for next season’s Champions League, but the 46-year-old is aiming higher still. During his official unveiling, Solskjaer stressed the importance of United winning a first domestic title since Alex Ferguson’s final year in charge in 2013. United have picked up 32 points from a possible 39 under Solskjaer and he believes this form can be the basis for challenging Manchester City and Liverpool next season. Solskjaer’s contract with Molde ended upon his arrival three months ago but United are now looking to forge a relationship with his previous employers. A goodwill payment of around £500,000 has been made to the Norwegian club and other gestures, such as a friendly match, have been mooted. But even though a return to Norway is now officially off the cards, Solskjaer will not allow either himself or his players to take United’s resurgence for granted.